This morning I woke up stiff. My back hurt, my knees hurt, I did something to my hamstring, my ankle hurts, my hands hurt. I guess the combination of standing around all weekend on concrete at an agility trial and a plyometric workout yesterday was too much for the old bod. I not only enjoy running my dog in agility, I also enjoy watching others compete. I can see how people handle especially tricky parts of the course to figure out what works and what doesn’t work. While the agility course itself was on turf, spectators watched from the concrete floor. And I’m so short that sitting down means that I can’t see… And I certainly wasn’t going to skip or change yesterday’s workout because I was on my feet all weekend. 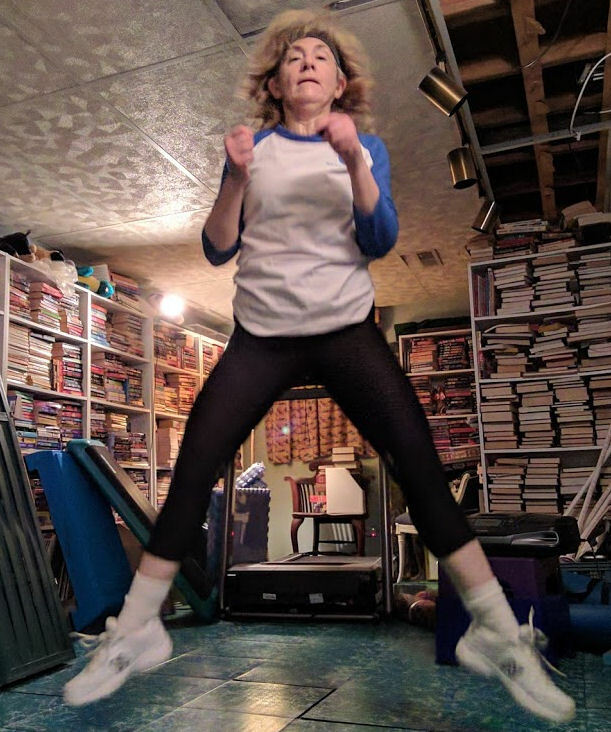 All the jumping in that plyometric workout helps keep me agile. But I knew that if I cater to my aches and pains, I’d just be complaining all day and moving would be even more difficult. So, I got up, stretched, and went through my normal morning routine. It may have been a tad bit slower than normal, but things needed to get done. I’m more careful today to get up and walk around more often so my hips and knees don’t stiffen up even more. And I am trying to drink more water to stay hydrated. This also helps keep everything moving. It’s also important that I not skip today’s workout. I have an upper body workout planned, focusing on the arms, chest, back and core. Yes, the lower body is also involved (no sitting! ), but the focus will be on the upper body. It’s imperative to keep moving. Why? Dog obedience class is tonight!